A lot of aircraft paint schemes are in either the “dull but practical” or “deliberately showy” category. 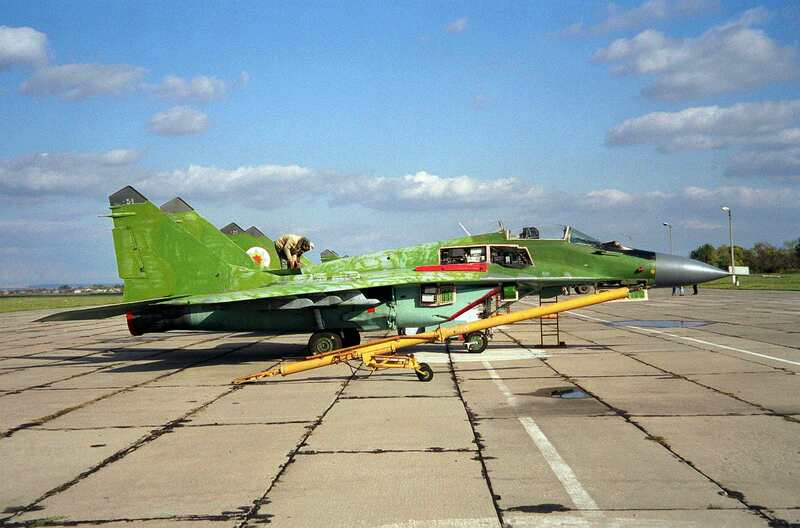 Then you have one of my personal favorites, used briefly by Moldova for MiG-29s. This Fulcrum, in the process of being shipped to the US as part of a purchase deal, has a very green color scheme. A lot of Soviet-era aircraft have a “ground color on top to help camouflage when viewed from above and blue underneath to help when viewed from below” paint scheme. This has a dark green on top and light, seafoam green on the bottom color. MiG-29s have displayed some very interesting color schemes over the years, and there’s a site that has chronicled them with excellent illustrations. I like interesting footnotes like this. This article was posted in Article, History and tagged Aviation, MiG-29, Moldova, Paint Scheme. Bookmark the permalink. Follow comments with the RSS feed for this post. Both comments and trackbacks are closed.